The mosquito is the most important hepatoprotective plant of TČM. It is widely used in hepatic diseases ( Lam2016hec ). It comes from India and is attributed to antibiotic , antiviral , bile duct and antidiabetic effects. It contains diterpenes and lactones (andrografiolid, deoxyandrografiolid, neoandrografiolid and chuanxinlian D), which give it a very bitter taste ( Akbar2011apr ). Andrographiside and neoandrografiol are as effective as silymarin from the crocodile, the andrografiol activity is slightly lower ( Kapil1993aem ). However, these lactones contain large quantities of the lactone, so that its hepatoprotective effects are considered to be even stronger than those of the crocodile. 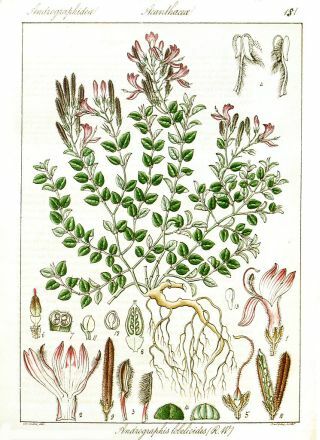 Both plants are complementary and are ideal for the production of bitter liqueurs.